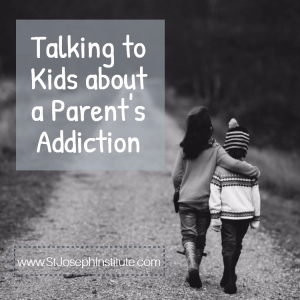 Talking to kids about a parent’s substance abuse problem isn’t easy, but this is a conversation you simply can’t ignore. Brushing the topic aside gives children the message that addiction is a shameful family secret. Instead, plan to discuss a parent’s decision to seek treatment in an age-appropriate manner—setting the stage for open and honest communication. According to the National Association for Children of Alcoholics, the 7 C’s of addiction can serve as a useful framework for helping children understand a parent’s substance abuse problem and how it affects their own lives. After you’ve talked to your child, consider sharing a copy of the 7 C’s of addiction. Your child may wish to display a copy of this information in his or her bedroom or to carry it in a wallet or backpack as a reminder of how to handle conflicting feelings surrounding a parent’s substance abuse treatment. At this age, children still live in a me-centered world. This means they’re likely to blame themselves for a parent’s addiction-related behavior. Your task is help your child understand that their mother or father’s addiction is not their fault and to reassure them of your family’s love and commitment to each other. You can begin the conversation by bringing up an example of behavior that your child witnessed, such as an argument occurring after your spouse missed your child’s school play to go out drinking with friends. Explain that addiction is a disease that causes people to make bad choices, even when they know those bad choices hurt themselves or others. Stress that the parent in treatment is getting help for his or her illness, much like you would take your child to the doctor for a high fever or a bad cut. Tweens are at the stage of their lives where they’re attuned to rumors and gossip. When you talk to your tween about a parent’s addiction, your goal should be to make sure he or she has all the facts. Plan to talk to your tween in a calm, quiet location that’s free of distractions. State the facts simply, saying that the parent is addicted to drugs or alcohol and is seeking treatment for this illness. Give your tween ample opportunity to ask questions, answering as truthfully as you are able to. Stress the importance of coming to together as family during this time and invite your tween to come to you whenever he or she is feeling sad or angry about the situation. Teens often have a different perspective on addiction than younger children. They may be resentful for having to handle household chores and care for younger siblings when a parent is under the influence. They may also be jealous of friends who they view as having “perfect” families. When you’re talking to your teen, express your appreciation for all your teen has done to help the family during this time and acknowledge the impact this experience has had on his or her life. You can point out that all families have their own struggles, but avoid taking a condescending or dismissive tone. Teens will often shut down if they feel they’re not being respected as part of the conversation. After your teen has had a chance to process the initial discussion, you should broach the subject of what a family history of addiction means. While genetics aren’t destiny, studies have shown that having a parent or other close relative who suffers from addiction does increase a teen’s risk of developing a substance abuse problem. Stress your concern for your teen’s wellbeing and help him or her explore interests and hobbies that can will reduce the urge to experiment with drugs and alcohol. The experience of living with a parent’s addiction can cause some children to act out. If you notice that your child is experiencing signs of depression or anxiety, such as changes in appetite, sleeping patterns, academic performance, and time spent with friends, he or she may be in need of counseling to help process the feelings associated with a parent in treatment. Your pediatrician can refer you to a qualified therapist in your area. Attending Ala-teen or a related support group for children in similar situations may also be beneficial.